MNL 143 is as much a love song to the crazy/beautiful metropolis of Manila as it is a love story between two people who do not look like movie stars. In Philippine cinema, the lead characters of a love story have to be portrayed by beautiful actors. That is the reason why Emerson Reyes, MNL 143’s director, came at loggerheads with Cinemalaya’s organizers: they wanted to replace the director’s cast with younger, more physically attractive people. Reyes should be commended for sticking to his vision. It’s about time a Pinoy movie features a love story of two ordinary-looking people. That said, it’s just unfortunate that MNL 143 spends much of its time not on the love story but on sketches of public transport life, sketches that are as light-hearted as they are utterly trite, if not a little juvenile. Ramil (Allan Paule) is a forty-something mini-van driver who, like Julio Madiaga in Lino Brocka’s Maynila sa Kuko ng Liwanag (1975), has been searching for his beloved, Mila (Joy Viado) in the megacity of Manila. We learn that the two met and fell in love in some provincial town until Ramil decided to work in Saudi Arabia so he could save up enough money for their future together. It is intimated that they lost contact over the years. When his contract ended, he came back to the town still hoping to marry Mila and was told that she went to Manila to strike out on her own, devastated as she was by Ramil’s departure. Ramil spends the next five years working as a public transport driver in the hope that Mila might someday hop on as his passenger. Having finally lost hope of ever finding her, he decides to go back to Saudi Arabia. The film shows what happens on his last day of plying his taxi from Buendia (in Pasay City) to Fairview (in Quezon City), an approximately 25 km-long route that would take about 90 minutes, give or take a few for traffic flow variations. The bulk of passengers, though, hop on and off throughout the course of the ride, much like bus passengers would, and director Reyes handpicks passenger types to people his “road trip” film. There’s the cranky old woman who complains about everything (the traffic, the heat, Ramil’s driving, etc. ); two guys who tell each other racist jokes in Tagalog when a Japanese girl rides beside them, only to learn later that she can understand Tagalog; a chef who videotapes a hole on the pants of a sleeping passenger in front of him; two hyperactive students making a film for a class project; three gay men talking about unrequited love; among others. For MNL 143, Reyes attempts to move out of the constricted bedroom space and uses the whole metropolis as backdrop for his love story. In parts of the film, he succeeds in showing the city’s chaos, noise, and heat. There are also beautiful shots of the streets crawling with various modes of transport. Reyes’ romantic Manila is vastly different from Brocka’s predatory Manila. It’s as if Reyes is saying, “Hey, Manila is not just a city of slums and hardship, it’s also a city of middle-class commuters and of hopeless romantics”. For the most part, though, Reyes could not resist going back to his comfort zone of capturing realistic conversations within a confined space. But his decision to do this by focusing on passenger sketches that have nothing to do with the main storyline (save for some few hints on not giving up on love) instead of further building audience empathy for Ramil, leaves the viewer uninvested in Ramil’s quest. Throughout the film I was waiting to be pulled in but the unimaginative and pointless passenger sketches held me at arm’s length. That is why that extended crying scene of Ramil brought about by a love song playing on the radio does not do anything for the viewer except maybe to appreciate Paule’s acting skills. The only time the film engaged me was towards the end, (spoiler warning) when Mila shows up, even if there were lapses that don’t make sense (like Ramil all of a sudden not objecting to two passengers riding on the front seat, Ramil not immediately recognizing Mila’s very distinctive voice, and Paule’s acting lacking any hint of excitement once his character realizes that the woman he’s been searching for thirteen years is sitting on the front seat of his cab). Still, one can’t help but feel kilig when two ordinary-looking people get a chance to reignite their love story. It’s a slap to the faces of movie studio executives and festival directors who still cling to the Jurassic idea that only pretty people falling in love are worth watching onscreen. The film’s saving grace is its music. Since there’s no musical scoring, key moments are punctuated by new songs written expressly for the film by such talented artists as Jensen Gomez, Peryodiko, Fando and Lis, among others. In the end, I’m still happy that this film was made (and on the director’s own terms). Emerson Reyes is young and promising, and I have extreme confidence that he’ll only improve in the future. Called “FX” in the Philippines, derived from the most common vehicle model used, the Toyota Tamaraw FX. Thelma’s saving grace is the performance of its supporting cast and the panoramic scenes of Ilocos province. Other than these, the film comes off as inordinately polished, robbed of the pathos and struggles required of this genre and is a tame, dull and tedious chronicle of an aspiring athlete’s fight against the odds. 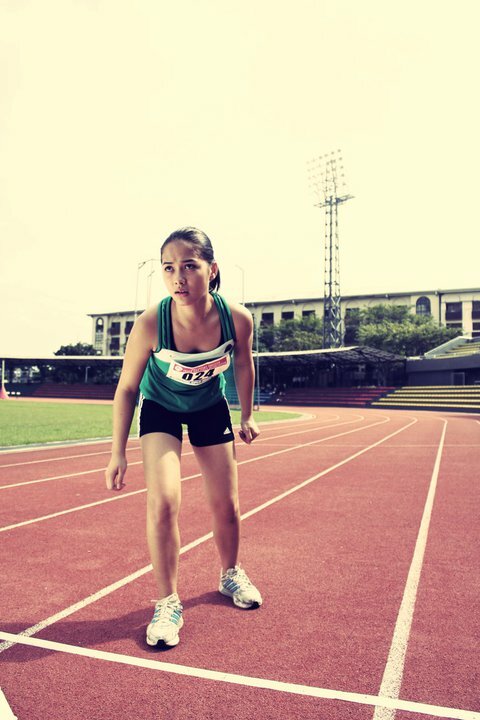 Maja Salvador is Thelma, a farm lass gifted with speed. She initially regards the gift as respite but later realized it could well save her family. A young girl suddenly thrust into adulthood, Thelma struggles with numerous hardships. Salvador’s awkward Iloko tone, her less-than graceful sprinting form, the supposed transformation from wayward adolescent to responsible adult are failures in portrayals of conflict and depth. Crucial to Thelma’s character is the onset of adulthood and how it descended on her by way of guilt and filial responsibility. Salvador missed this subtle leap, overtaken perhaps by the random miles the character had to run to keep track. Born to a poor, farming family, Thelma’s days are divided between house chores, school, play and petty adventures with her sister Hannah (Eliza Pineda). They barely get by, thriving on farm produce and weaving. Thelma’s refuge is running on paddy fields and paved streets. Her stubborn streak often gets her in trouble. She is not as brilliant in school as her sister but proves indispensable at home. She recognizes her gift but is reluctant to train because she feels discomfort from people watching her run. She plods through her days until an accident forces her to grow up. The sisters take the short route to school requiring them to cross a main highway of speeding vehicles. As was the custom, Thelma takes the lead and sprints over to the other side. On one such day, Thelma sulked and refused to go to school leaving Hannah to cross the road alone. Hit by a car, Hannah ends up with a broken leg. The brilliant child suddenly has to stop schooling and is now confined to a wheelchair. Driven by guilt, Thelma stumbles upon her athletic calling and is thrust into the adult world of responsibilities and filial obligations. The shift in the story demands that this reckoning (of Thelma’s acceptance of destiny) be conveyed fulsomely across the screen; lest we miss the subtlety of the entire narrative. Alas, such delicacy rests on how skilfully a performer enacts inner turmoil. In Thelma’s case, this is the combined weight of liability and remorse. Such portrayal requires sensitive embodiment so we can yet again feel and be reminded of the torment of choice. This embodiment is vital to the story especially as it chronicles the travails of an athlete whose success lies in disciplining the body and spirit. Thelma in the cusp of adulthood is supposed to live this conflict but it seems Hannah the sister, grows up more eloquently. In scenes where the sisters confront their lives of poverty and seeming hopelessness, Hannah shines with effortless depth while Thelma self-consciously grapples with emotions. Thelma’s talent turns out to be a legacy from her mother, a track and field champion in her youth. She chose marriage however, and stopped training because of childbirth. Encouraged by her mother, Thelma begins to train and eventually lands a scholarship in Manila. Her training days are not without strife. She sends home her stipend and survives on the little that’s left. Thelma commits to having her sister operated on so she is able to walk. She confronts distractions and challenges. All seemed petty within the overall gravity of the movie’s claim to inspire. The biggest blow is learning her mother suffers from cancer. Torn between training and the yearning to care for her ill mother, Thelma has to make a choice. As expected, she triumphs in the end supported by a family who encourages her to stay in the city and continue her athletic training. Thelma sags from the burden of its self-conscious depiction of inspiration and hope. It seeks to portray the triumph of will but fails to coherently explore the depth of the human struggle to conquer fear and faltering commitment. The opening and closing sequences are replete with clichés, marking this unneeded reticence. If at all, the film refuses to let go of this tight grip resulting to scenes appearing stilted, lacking flow no matter how beautifully shot. While it aims to be buoyant and light, it is instead captive to gravity. Succumbing to formulaic shots of landscape, it fails to poetically yoke character and place. Thelma likens herself to the windmills of Bangui whose harnessed energy fuels households, but the dialogue barely corresponds to a remarkable image or scene. Halfway through, the viewer makes an easy prediction that Thelma after all succeeds and wins first place in any of the numerous races she competes in. Thelma fails to depict the full flowering of triumph that films of its kind aspire to. Thelma’s hope is her own, held hostage by the screen. It does not spill over nor kindles a fiery equal in the hearts of viewers.